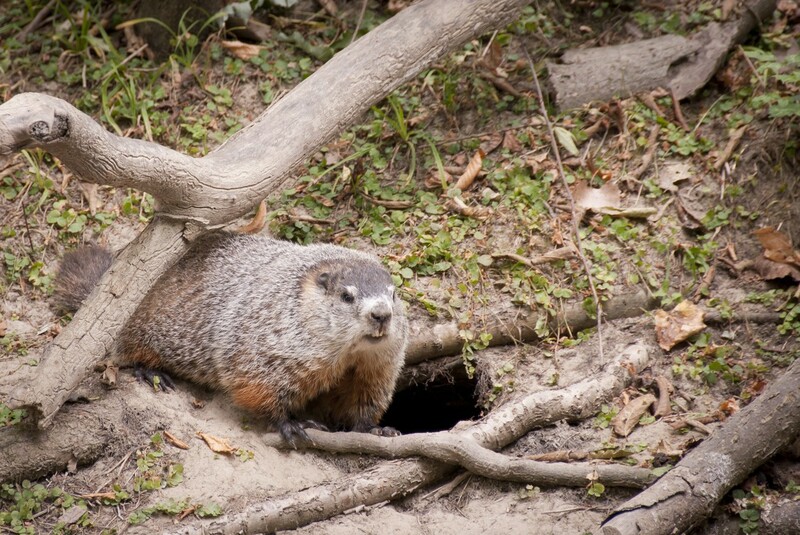 Woodchucks have long been a problem for farmers and weekend gardeners. When populations surge, woodchucks will damage crops and food plots. Farmers have wide open areas where they can practice woodchuck control by shooting. However, such control measures are not an option when woodchucks move into residential neighborhoods. This problem seems to be on the rise. As woodchucks learn to live in populated areas, they have become more difficult to control. They have few natural predators and their shy personality makes them difficult to manage. Around the home, woodchucks will feed on just about any plant or flower. Woodchucks will damage plants quickly with normal feeding. They particularly like tomatoes, fruit or any ground growing vegetable. Most weekend gardeners will attest to the persistence these stocky creatures will demonstrate when trying to get to a certain garden plan they desire. Woodchucks are members of the squirrel family. They are the largest of all squirrels and are commonly known as woodchucks or groundhogs. Though distributed across the United States, there are some regions where chucks are non-existent. Woodchucks are stocky. On average, they weigh 5-15 lbs when mature and have short ears and legs relative to their body. 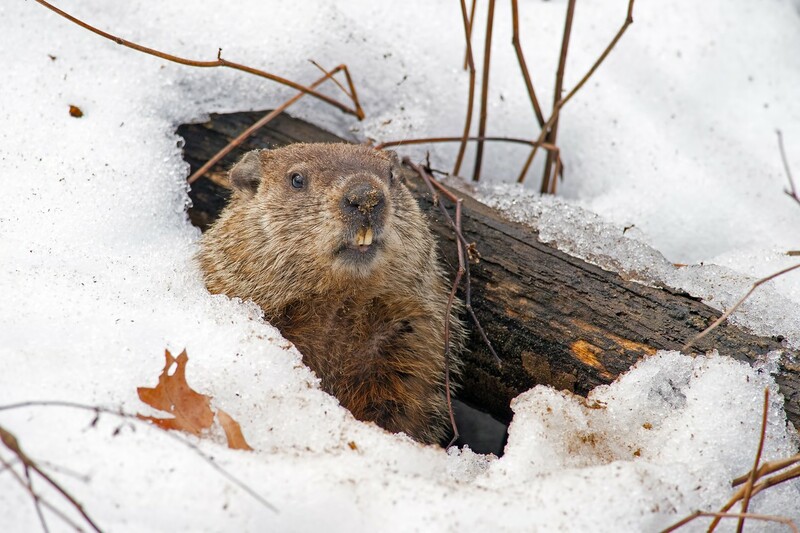 In northern states, woodchucks will hibernate. They like to feed in the early morning and late afternoon. However, it is common to see them lying in the sun around their burrows. Woodchucks reproduce once a year and produce litters which have 4-8 young. Populations usually don’t grow too large yet they mere existence can cause economic damage. Woodchucks will readily burrow under the slabs of homes, patio’s, driveways and sheds which will lead to structural problems. More devastating are the broken legs and other injuries horses and cattle sustain from stepping in a woodchuck burrow. This is why horse farms, cattle ranches and any farm which has large livestock must keep woodchuck populations to a minimum. Around the home, most woodchuck problems arise when they target plants. And once they find a good food source, they’re more likely to build dens and burrows. To keep chucks out of the yard, there are three repellent options proven to help. If there is a good supply of food on land surrounding your property, treat your desirable plants with PEST RID. This will make the plant taste bad and cause foraging chucks to go elsewhere for a meal. Pest Rid is not a poison; it simply tastes terrible. 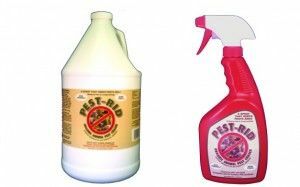 Made from all natural ingredients, Pest Rid can be used safely on any plant or area where chucks like to visit. Expect to get 4-6 weeks of residual per treatment which is usually long enough to force the chuck to go. Rain will break it down, but it has such a strong flavor that even trace amounts are usually enough to keep animals away. In a short period of time, the woodchuck will find another food supply to keep it happy. This will allow you to keep the plants you want to grow and not have to remove the woodchuck. Pestrid is ready to spray and requires no mixing. 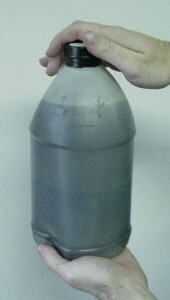 Quarts come in a handy spray bottle and will cover up to 125 sq/ft of plant foliage. Gallons will cover up to 500 sq/ft. Another way to keep woodchucks from foraging onto your land is to place out predator uring. COYOTE and RED FOX URINE will generally keep them away as will BOBCAT URINE. These animals readily harvest woodchucks so if their urine is found in your yard, the smell will effectively “warn” approaching animals that danger is active in the area. Use 2-4 oz every 10-20 feet by sprinkling it along points of entry, hedgerows or fence lines. Coyote Urine is the most common since coyote cover the largest area where groundhogs reside. Treatments will last up to a month and can be applied directly to the ground although sprinkling some on the trunk of a tree is a good way to use some too. If you believe fox are more active in your region, go with this scent. Bobcat urine is maybe the strongest option but for this to work, you must have bobcat in your region. To help prolong the residual of the urine applied, use CAPSULE or LIQUID GUARDS. These containers will protect the urine from the environment so applications will last 2-3 times longer compared to just sprinkling it out on the ground. LIQUID GUARDS hold more urine and work the same way. Install these every 10 feet along borders. Use capsule guards when you need something more “discreet” since they set in the ground and effectively disappear. Where possible, use liquid guards since they can hold more material and require less maintanance. One of the easiest ways to keep woodchucks off your property is to install ULTRA SOUND REPELLERS. These devices send out ultra sound by default. Ultra sound is in a frequency humans can’t hear but animals can. To woodchucks, these sounds are disruptive making them feel uncomfortable. By installing units along property borders pointed at entry points, you can keep groundhogs from entering your yard. Our devices have a range of settings including an “always on” setting or the units can be triggered to go on via their built in motion detector. Either setting will keep woodchucks from entering gardens and destroying plants. 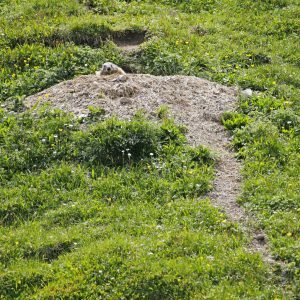 So if you have woodchucks active in fields surrounding your yard and don’t want them nesting in your property, set units up pointed to where they might enter. If you already have active animals targeting plants, use the included power supply if possible so you can keep the unit turned to “always on”. We have 33 foot and 66 foot electric cord extenders so if needed so you can reach units located far from the home. Cables can be buried in the ground for discreet installations. Other features of the unit include an optional “audible” sound. Generally this is not needed for woodchuck but if you are powering units by batteries, using the audible sound turned up will make them more effective. For woodchucks, set the Operating Time to any of the 3 options depending on when your chucks are most active. If powered by batteries, set it to Motion Detector with sensitivity at “30”. Use audible sound too and set that to “40-80”. If powered by the included power supply AC brick, set the ultrasound to “Constant”, turn the “Sonic Volume” to the far left which will turn off all audible sound as you will not need this on. Remember, using the included power supply with the power always on will enable the unit to cover the most area as possible because the chucks will detect the unit from afar. 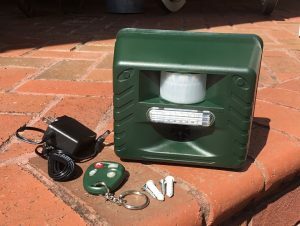 But if you don’t have a nearby outlet for power, use batteries and understand the motion sensor will only trigger when target animals come within 40-50 feet of the unit. The Frequency (yellow knob) should be set in the middle regardless of the power option and in general, using batteries and motion detection will keep them away just as effectively compared to powering them with electricity. Units should be placed 1-2 feet above ground and pointed in the direction where animals are entering as well as “over” the turf you want to protect. Woodchucks are actually easy to trap. And you can trap them using a live cage or kill traps. In most cases, trapping success will largely depend on where you’re seeing active chucks and what they’re eating. So if they’re feeding on a plant in your yard, then use that plant for bait. Live traps should be placed alongside burrows if possible if you don’t know where they’re eating. But if they’re focused on a specific shrub or something growing in your garden like carrots or lettuce, then you can trap them alongside your vegetables. For most any scenario, our LT111230 will do the job. Its easy to set and will fit any size woodchuck. 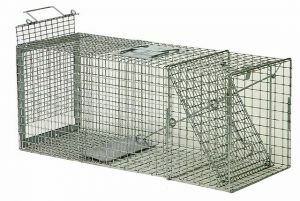 Available with an optional rear sliding door for easy sets and animal releases, this trap will last many years and can handle a range of animals 20 lbs or less. Another trap to consider is the LT111236BD. This is a unique design well suited for trapping directly over dens and burrows. 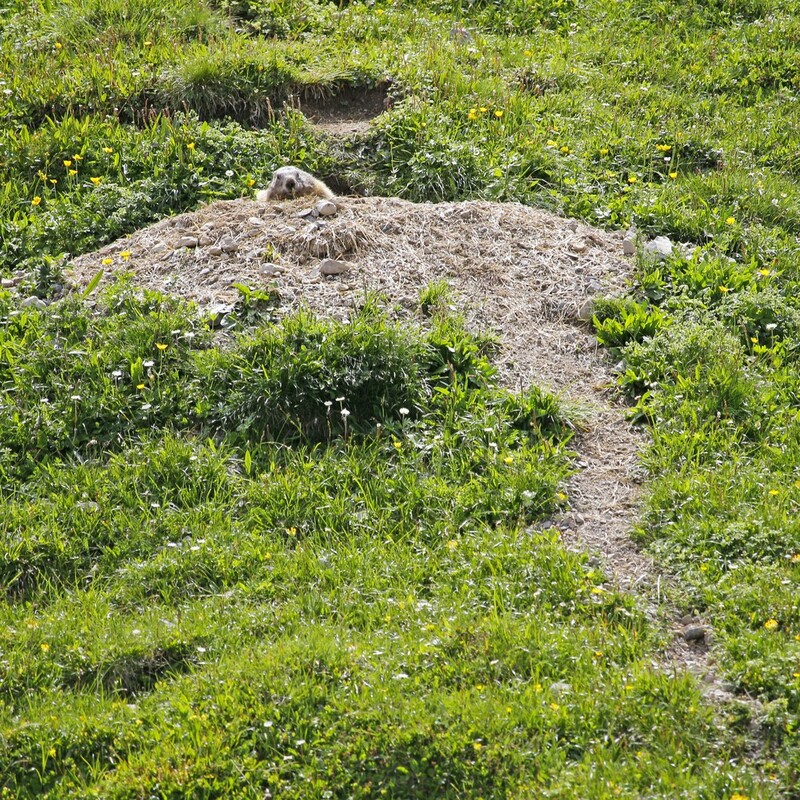 Many woodchuck dens have holes which go straight down. This trap takes advantage of dens built this way. First, the trap has sliding doors on the back and the front. The back sliding door is good for quick access for baiting and animal release. The front sliding door will be used or not used depending on the type of set you want to make. So if you want to use it like the LT111230 then you would simply remove the front sliding door, bait it and set it where you expect to have a woodchuck active. However, the real advantage of this trap is when you place it over a den hole housing the woodchuck you want to trap. By keeping the front sliding door, you can now place the trap directly over the animals hole. This can be done since the trap has no bottom in the front quarter of it’s design. When placed over the entrance/exit hole, the woodchuck will have to enter the trap since it will have no where else to go. Once inside, it can only go in one direction. This will ensure the animal gets trapped because once the front door closes, the bottom entrance will no longer be available for escape. Basically the bottom access hole is NOT PART OF THE HOLDING SECTION. This prevents any possibility for the trapped animal to get away. So effective is this design that in many cases, you don’t need to bait it for success. But we do recommend using one of the baits listed below to help get the job done faster. Especially if you’re using the LT111230. When live trapping, its always best to pre-bait an area close to where the animal is active. By pre-baiting, you’ll be getting the animal used to feeding at a particular location. 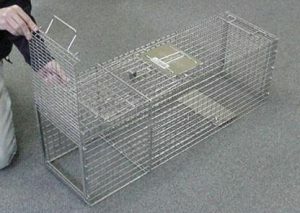 This will prove helpful by making the animal comfortable to the set up once the trap is introduced. But to ensure success, use either TRAPPERS CHOICE HOG FORMULA I and TRAPPERS CHOICE HOG FORMULA II food baits. These are two strong scented baits which work by releasing a smell woodchucks can’t resist. Simply add an ounce or two on top of the plant they’re targeting. Your catches will be faster and more consistent. Another lure that can help is TRAILING SCENT. This is yet another food based scenting lure but different in that it does not work on sight as much as it works on volatility and dispersion. Trailing scent comes packaged in small eye-drop like dispensers which are designed to release single drops. Use it by placing a drop or two at the traps entrance. Next, set out several drops in different directions out and away from the trap. Squeeze single drops every foot and in a line at least 10-30 feet from the trap. The idea of this process is to create a large area which smells good to the chuck as well as a “line” that will direct the chuck to the traps entrance. Designed to work with the bait listed above, match up the trailing scent with the bait. In other words, if you get Hog Formula I above, get Trailing Scent I. Once caught, relocate the animal at least 10 miles away. Try to release chucks early in the morning in an area where it will readily find food and shelter. If you are not interested in trapping animals alive, consider a kill trap. These are devices generally used by professional trappers when the property owner wants fast results. They work by snapping shut over the animals head leading to an instant death. Woodchucks are easy to trap this way since the trap can be set right over their dens. When the animal tries to exit, it will hit the trigger of the trap with it’s head leading to its death. These traps come in many sizes but the BODYGRIP 220 is the best one suited for woodchuck. You will need to secure it to a stake which should be alongside the den. A tree or stump will do as well. For example, in the picture to the right, you can see the den directly behind the woodchuck. This would be an easy to place to lay a trap over the hole and then for an anchor, the large root above could hold the trap in place. If the chuck is moving through a hole in a fence or if the den is positioned more horizontal and not vertical, using a BODYGRIP TRAP STAND may make the set easier to manage. 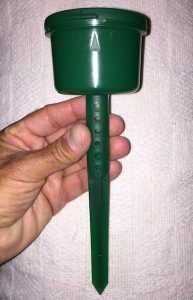 This device can be used to hold the trap in a “standing” position. The Trap Stand comes with a long rebar stake for securing it to the ground. If you’re new to using bodygrip traps, get a pair of SETTERS. The springs of the Bodygrip are quite strong and the setters will give you much needed leverage to make the set safely. Is poison not usually ever recommended for woodchuck control? I live out west and these are called rockchucks and often live in rocky dens. These particular animals are living under the slab of a steel building. I believe what you’re talking about are what some of our customers call marmots. They do tend to live around rocks as you describe and are close cousins to the east coast chucks. Unfortunately, at this time there is no poison for either. This is probably true because these animals are large and therefore would require quite a bit of any one product to have an impact. And for that reason, the government is most likely hesitant to label anything that would be used in such a large amount because it would no doubt pose a hazard to non target animals. But we have heard reports of people using other types of animal bait to target chucks. Of course, we’re not allowed to recommend such behavior since it’s not on the label but if something can kill a mole or gopher, it can probably kill a chuck if they eat enough of it. And if either of these are mixed with a good chuck lure, they’ll consume as much as you offer. I also know a couple of lures marmots love is our Grub Bait and our Woodchuck Food Lure. In summary, there are poisons that can kill chucks but it’s not legal us for sell them with that implicit intent so we can’t recommend such use. Thanks again for your help with marmots. I need to kill some that are living under a boxcar on my customers property. I think I would like to use your kill traps. I want to do it right the first time, so my question is how many traps should I use? There are three, I believe, holes that have been dug under the boxcar. My first thought would be to have at least that many traps set- do you agree? If I cover all the holes with traps, will I still need bait? These holes are at ground level- will I need the stands? In our experience, the traps are by far the most effective, quick way to get control. They only need to be placed over the den entrances, without any kind of stand, and in most cases you’ll get instant results. The key is making sure you have every hole covered when you set them out. This way there will be no way for them to avoid getting caught. So how many traps should you use? As many as you have holes to cover. And no bait will be needed. Where do you buy Ropel? Dear woodchuck man, I live in New York State in the country. I own a small trailer park. One of my tenants is complaining about a wood chuck eating through the floor of their trailer trying to get in. What I’m asking is this possible for a wood chuck or woodchucks? Thank you for your time in this matter. Russell Hanson. Woodchucks can definitely chew through a wood floor and we have seen this happen many times. They commonly do this in wood sheds but we’ve seen it happen to homes and trailers too. And as our article above explains, the best way to handle a local problem is to live trap them using one of the traps above. I suggest you place it under the trailer, close to where they are chewing the floor, and if you bait it with our Woodchuck Food Bait, I’m sure you’ll get fast results.